Do you ever notice how much of our lives is improvised? Really, I feel I go about life with little-to-no definite plan of action, and the truth is that most of the time I'm just winging it. I thumb through books and skim over blogs and pick the brains of people who have gone before me all in an attempt at gracefully dealing with whatever situation I find myself facing, like sleep training babies and disciplining toddlers and making my life both orderly and functional as well as creative and meaningful. As much as I try to pretend, the truth is I haven't the slightest idea how to actually make some of these things happen. And so I live my life wavering between a constant state of panic that I'm not doing things exactly as they should be done and learning to lighten up and go with the flow. It's a dance that I'm getting pretty used to, if not good at. Example: I have gotten used to the idea that our now-11 month old will never learn how to drink from a bottle (despite our best efforts to teach her), and that letting our two year old skip a nap is far preferable than trying to force her to take one anywhere other than her own bed. Also (and no less important) I've learned that making classic pot roast in a crock pot is simple to do once you know the basics. I admit, I started out the day a little nervous at the prospect of making this classic. I have made fancy roast beef in the oven, and I have made pork roast in the crock pot, but I could not remember the last time I had made classic pot roast with carrots and potatoes in a crock pot (or if I have ever done it at all). This realization confused me a bit because this used to be the meal in my house, the one that got me almost more excited to eat dinner than anything else. Oh, the joy of coming home from school to the aroma of a big roast cooking in the crock pot, encircled by potatoes and carrots. It was a staple in our house when I was growing up, the kind of thing that never ever ever got old, even though we had for dinner fairly often. We would shred the meat and drizzle it with its own juices, a dash of Worcestershire sauce, and nice dollop of ketchup on the side, and enjoy every bite of those meaty potatoes and carrots. Having made this dinner over and over during my childhood, my mom was the first person I thought to ask for instructions on how to make it, but she couldn't remember how she did it, exactly. She couldn't give really specific instructions at least, which is what I was after. Alas. To the computer I went, and as it turns out, everyone has an opinion for how to make pot roast, stemming from a combination of how their own mothers used to make it and their own trial and error. Two dozen recipes later, I realized a simple truth: I was wasting my time because I already knew what to do: I would improvise. The general consensus of all of these recipes was the same: put the roast in the crock pot, make sure to season it, add a little liquid and let the heat do the rest. Armed with that information, I headed into the kitchen and just did my thing. That is perhaps why I like the kitchen so much: it is a place where I am free to make mistakes because most of the time, the mistake yields a delicious discovery. (Unless, of course, you add one cup of salt to a batch of chocolate chip cookie dough instead of one teaspoon. Speaking from experience.) In the kitchen, imperfectly perfect is beautiful. In the kitchen, there is room for interpretation and for improvising. For taking what you do know and applying it to the situation in which you find yourself. Believe it or not, this mode of thinking helps me as a mom. Despite all the best parenting advice I have ever read, no one has raised these kids before, with a mix of quirks and personalities all their own. And so, the best I can do is apply whatever knowledge I have gleaned along the way to the choices I make every day as their mother, never forgetting that I am their mother, and I know a thing or two about them. I envision the sort of people I hope they become, and I'm doing the best I can to nurture them toward that without putting unrealistic expectations on them or on myself. And I do it, for the most part, simply by doing. I think that's the best any of us can do sometimes. Envision the outcome we hope for, do some research to help us figure out how to make it happen, and then jump right in and start doing the work it will take to meet our goal. I am pretty sure that deep down, we actually know a lot more than we think we know, and if we follow our instincts (and say a lot of prayers in the process), we will probably do better than we ever thought we could. Classic Pot Roast (in the Crock Pot)In my mind, basic is nearly synonymous with classic, so maybe this should be called "Basic Pot Roast (in the Crock Pot)." It is, after all, a very basic dish, one that could be dressed up with a variety of additional ingredients. Garlic, rosemary, thyme, mushrooms, red wine, or any other number of lovely flavors could be added to make it a fancier dish, but this, in my mind, is the classic, the one to start with to learn how to do it. After you do, follow your instincts and try something new. You might make a beautiful, delicious mistake. First, wash and dry the roast and cover it in kosher salt and pepper (you almost couldn't over do this). Then, over medium high heat, sear the meat on all four sides. The darker the color, the more flavor it will yield. Meanwhile, peel the onion and cut it into about 1/2" slices. Lay them in the bottom of the crock pot. Peel and cut the potatoes and carrots and set aside. When the meat is seared on all sides, lay it on top of the sliced onions. Pour 1/2 cup beef broth into the base of the crock pot. Put on the lid and turn the heat onto low. Cook for about 5 hours. At the 5 hour mark, add the carrots and potatoes, layering them around the roast in the crock pot. Cover and let continue to cook another 3 hours or so. When about ready to serve, you have a few choices. Remove everything and serve along with some of the juices (and Worcestershire sauce and Ketchup, if you're like my family), or remove the potatoes and carrots, set them aside, and thicken the juices in the crock pot while the roast continues cooking a little longer (add 1 tsp of cornstarch to a little bit of the cooking liquid and then stir in and re-cover; let simmer until it thickens a bit). You could even remove everything, strain the juice, and make a gravy out of it (cook on the stove and add butter, flour, etc. ), but that's a little more involved than I would get for this dish. The point is, do whatever your family would enjoy most. I am pretty convinced there are a great many "right" ways to make this classic, and very few (if any) wrong ones. Yes, so true and good. 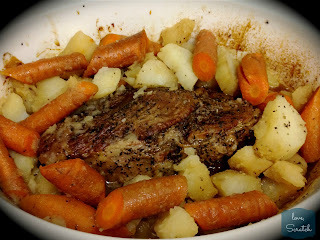 Write more, I love it:) And I love pot roast, and I will admit the last time I made it I got the prepackaged one from the store and just put it in the crockpot, ha ha. Love you. Thanks, Ash! Will do! Love you too!